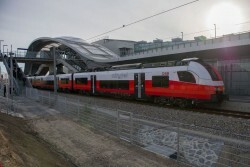 A first, important step towards a fast and safe train connection between the two EU capitals Vienna and Bratislava has been taken. After two years of construction, the so-called Vienna section was officially opened. This article includes a total of 570 words.